← The 3DC’s social channels you may or may not know about…. As you’ve likely come to expect month to month now, here is the anticipated notes from the tasting event hosted by Ian of PDX Whisky fame. Nose: Some mild Rye and surprising hint of iodine/bactine followed by honey. Finish: Nice balance of spice and toast, then followed by a rich honey sweetness at the end. Nose: Hot and heavy on the port followed by a hint of honey. Flavour: Tannins hit immediately, then into the deep port from the nose, followed by mild but balanced rye spice. Finish: The spice moves back into the port, which fades into oak tannins again, an hour glass effect of flavour. Nose: Strawberry and bubble gum followed by mild rye. Flavour: Oak and light toast, none of the sweetness implied by the nose. Finish: Light and watery with heavy tannins. Nose: Char and honey sweetness, again the rye spice at the back. Finish: Heat, then nothingness. It slowly vanishes then returns a bit later with a surprise bitterness to the end. Nose: Vegetation, a slightly ‘green’ odor, followed by toast. Nose: Sweetness of port and richness of fig. Flavour: Hot and rich caramel, big flavour and a huge mouthfeel. Finish: Char followed by chocolate into fudge. Clearly from above (and not so clearly from my lack of description of the rest of the group’s feelings) the big winner of the night was Big Bottom Whiskey. You may think I expected this to be the case, given how much I enjoy Ted’s product, but given it was tasted along side of two twelve year olds and an 18 year old bourbon, this was clearly an upset in the making! The group as a whole, and the majority of individuals all agreed that Big Bottom Whiskey was clearly the dram we’d all buy and stock on our shelves, while the other bourbons ran the gamut from “I might buy it” to “Nope never paying money for that one”. As always, a fun and enlightening night was had. 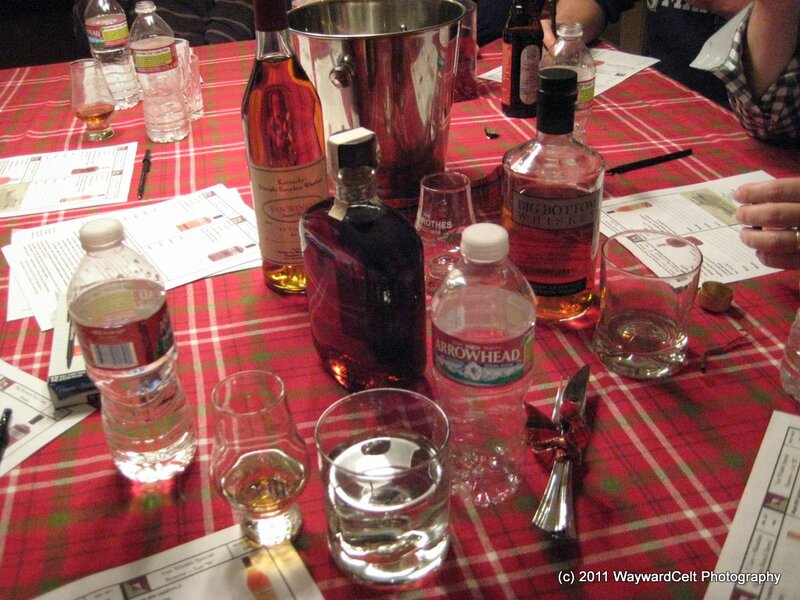 Anyone within the Portland area should really “Like” the PDX Whisky Facebook page and join us in January when the next event is scheduled and posted! Y’all are missing a great time! This entry was posted in American, Misc. Events. Bookmark the permalink.